Contact Downtown Miami Slip & Fall Lawyers Gerson & Schwartz, P.A. 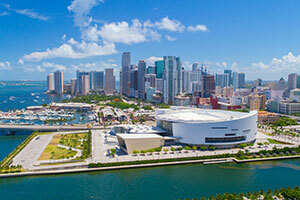 Downtown Miami is abundant with places for entertainment, shopping, and dining. The most important of them include the American Airlines Arena, Olympia Theater, Brickell City Center, many open-air malls, restaurants, bars, cafes, nightclubs, retail stores, and anything else you could imagine. But with that amount of foot traffic, trip and fall accidents and injuries happen in Downtown Miami. When you or a loved one suffers a serious injury in a trip and fall accident, then you will want to consult with the best Downtown Miami trip and fall attorney you can call. Getting injured in another type of trip and fall accident doesn't deprive you of the right to claim damages recovery. Just call the Downtown Miami trip and fall lawyers at Gerson & Schwartz and we will let you know about your options, no matter what type of accident you were injured at. When it comes to trip and fall accidents in Downtown Miami, you should know about the Florida premises liability and negligence laws. These may be applicable to every trip and fall accident that happens at the property of another. According to these laws, the person that operates with commercial premises is obliged to provide a reasonably safe environment for invited visitors, guests and patrons. It is called a duty of care. Shopping malls invite visitors to have a look around, shop, dine, and entertain; restaurants invite visitors to have a meal; and other stores welcome shoppers. The one thing everyone assumes is that as a customer they will be safe. But that isn’t always true. When commercial establishments breach the duty of care due to negligence, it can result in accidents and injuries. They have to keep the floor free of debris, garbage, and other foreign objects that could cause trip and fall. If they failed to do so, they may be liable for the accident and have to pay for your personal injuries sustained due to that accident. Very often they will say that the accident never happened, or that it was your fault. Sometimes, when they see they have nowhere to escape from responsibility, they’ll try to make you settle for minimal compensation. It may sound tempting, but don’t accept anything before speaking to a Downtown Miami trip and fall lawyer. The best thing to do now is to call our Downtown Miami trip and fall accident attorneys at Gerson and Schwartz for help. We offer free consultations at (305) 371-6000 for folks in your situation. Let's talk about your case, and you'll learn about the options ahead of you. We don't ask for fees unless we recover for you. Call (305) 371-6000 for free consultations with the bilingual Downtown Miami trip and fall accident lawyers at Gerson and Schwartz. That’s a good way to start moving toward financial compensation for your harms and losses. We never ask for fees until we get our clients recovered for damages.